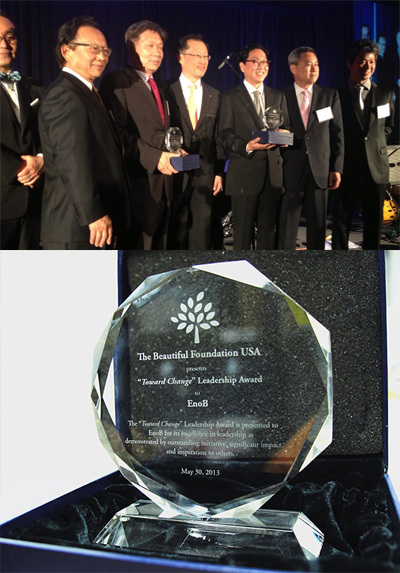 We are very honored to be given this award. 1부는 서울대학교 신경외과 백선하 교수님의 건강세미나가 있었고, 2부는 이노비 뮤지션들과 함께 한 가곡 음악회가 있었습니다. 이노비는 앞으로도 서울대학교병원과 함께 지속적으로 지역사회를 위한 건강세미나와 콘서트를 개최할 예정에 있습니다. 많은 관심 부탁드립니다. 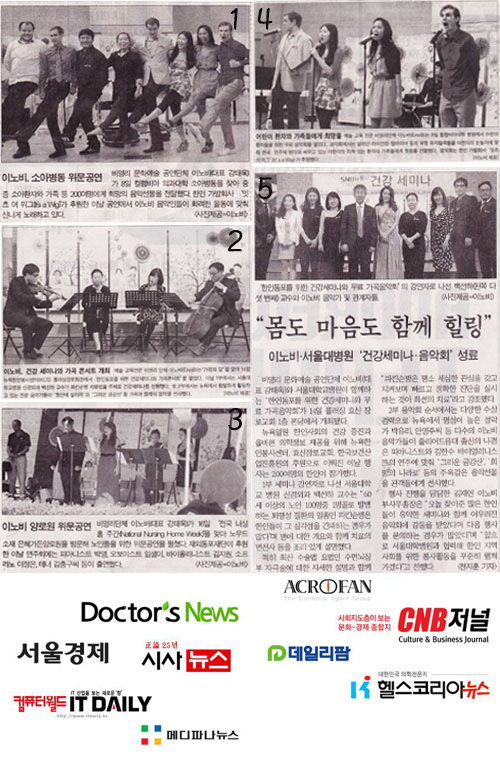 Seoul National University Hospital and EnoB collaborated on a Health Seminar and sponsored a free Traditional Music Concert for senior citizens in the Korean Community. On May 14th, EnoB and Seoul National University Hospital coordinated a Health Seminar and music concert for the Korean elderly. Seoul University Professor SunHa Baek's gave a Health Seminar as the first part of the event and EnoB musicians then played a Korean Traditional Music Concert. A video stream of the event can be viewed by clicking on the image. 지난 5월 16일에는 뉴저지 노우드에 있는 은혜가든 양로원에서 거동이 불편하신 어르신들을 찾아 뵙고 콘서트를 열었습니다. 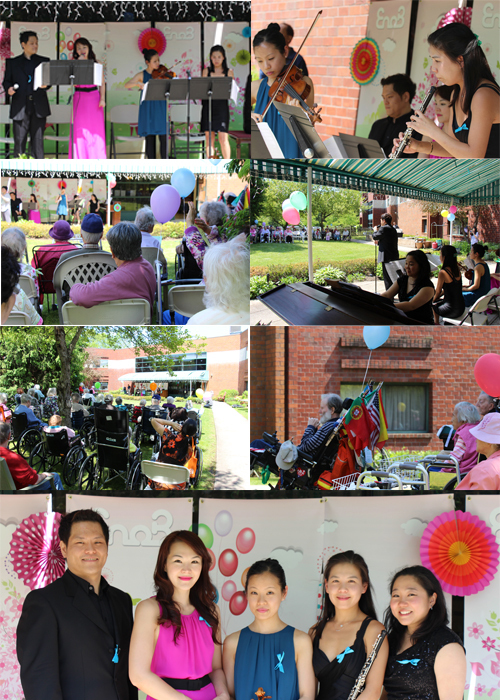 On May 16th, EnoB visited Mercy Garden Nursing Home located in Norwood, New Jersey and performed a music concert for the community there. EnoB’s repertoire included Western opera as well as traditional Korean music. 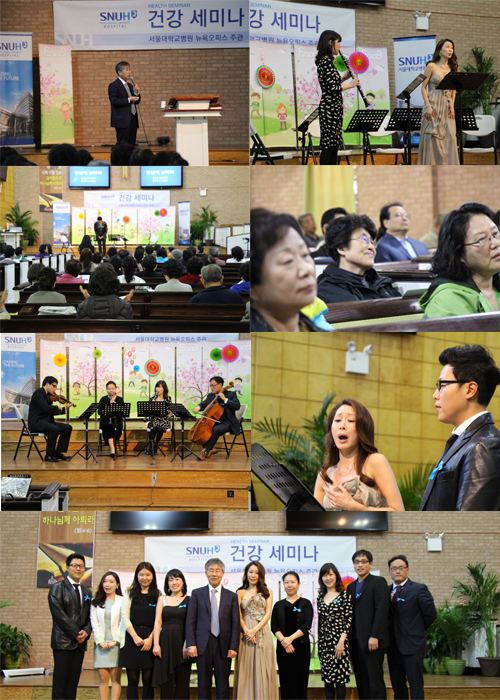 This concert was sponsored by the Overseas Koreans Foundation. 강태욱 대표님께서 지난달 서울에서 이노비 서울의 이사님들, 그리고 여러방면에서 이노비를 도와주시는 많은 분들과 좋은 만남을 가지셨습니다. 2. Sookmyung Women's University College of Music Professors Jung-ae Son & Jong-Wha Hong. 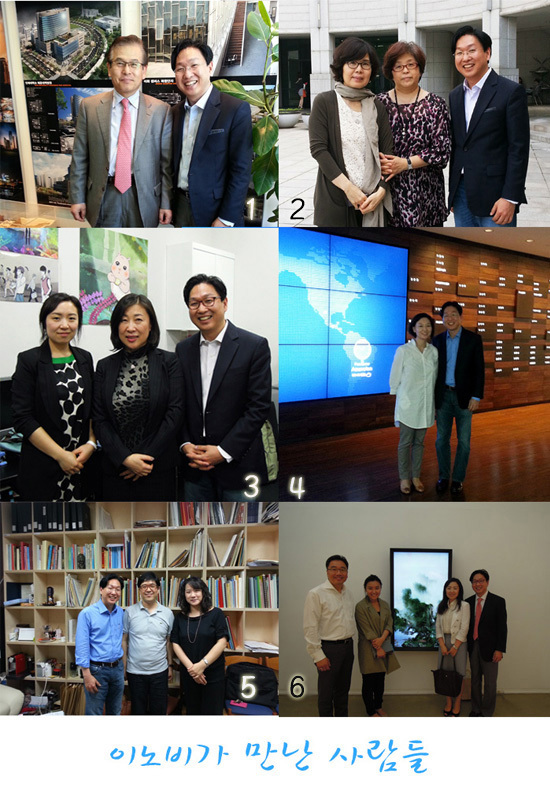 Director Jung Yu and Curator SeoMi Hwang of Can Foundation, Manager MaeHwa Yang and Director TaeWook Kang of EnoB at Space CAN Seoul Gallery, organized by the CAN Foundation. 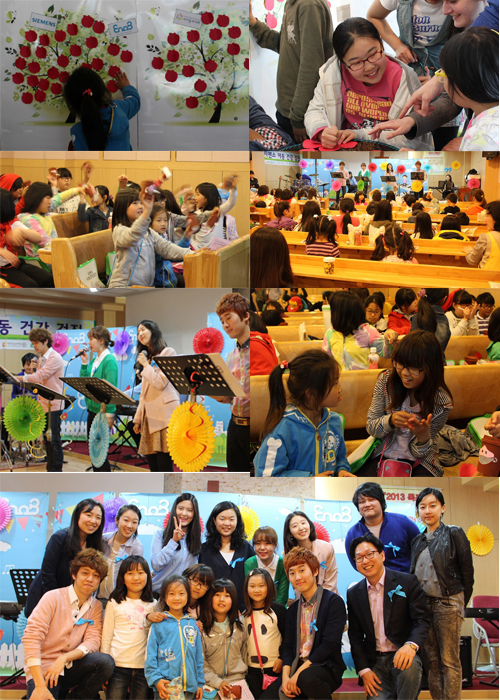 On May 11th, EnoB went to Hansarang Children's Center in Ilsan. 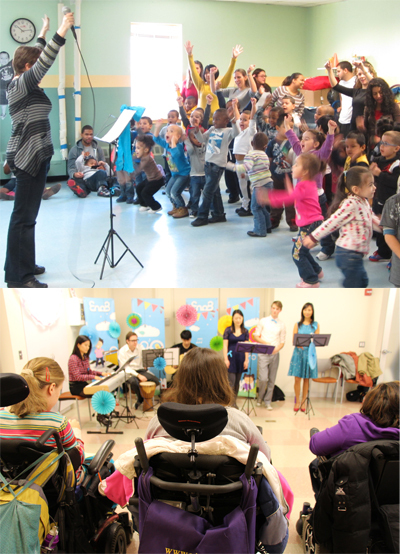 Enob performed a concert for 50 children at the center and had a wonderful time interacting with the audience. 학생들의 땀과 노력이 베인 무대에 환자분들의 얼굴에 웃음꽃이 활짝 피었습니다. 그 유쾌한 현장을 함께 보실까요? 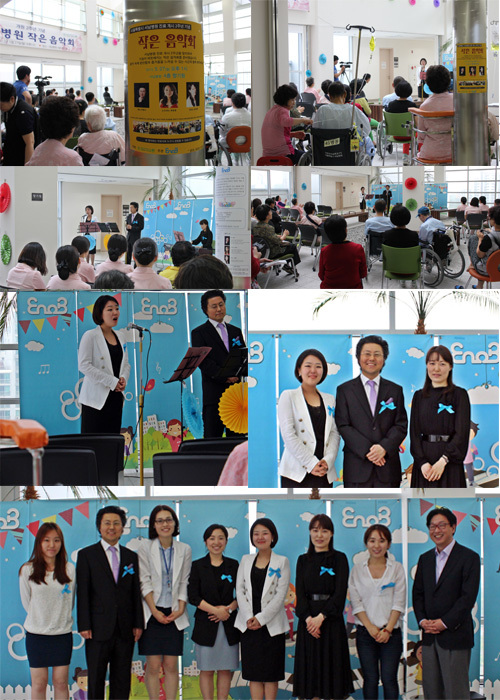 On May 14th, EnoB and students of Seoul Institutes of the Arts held a free concert for patients at the Bundang Jesaeng Hospital. The students of EnoB's Music Director Yun Young Park, who is also a professor at The Seoul Institute of Arts, participated as singers and actors at the Musical Concert. 5 월 27일, 서울특별시 서남병원의 진료 개시 2주년을 기념하여 이노비가 환자분들을 위한 작은 음악회를 열어드렸습니다. 테너 박창수, 소프라노 박찬정, 피아니스트 위정혜 세 분의 마음을 담은 무대가 모두의 가슴을 따뜻하게 채워주는 시간이었습니다. 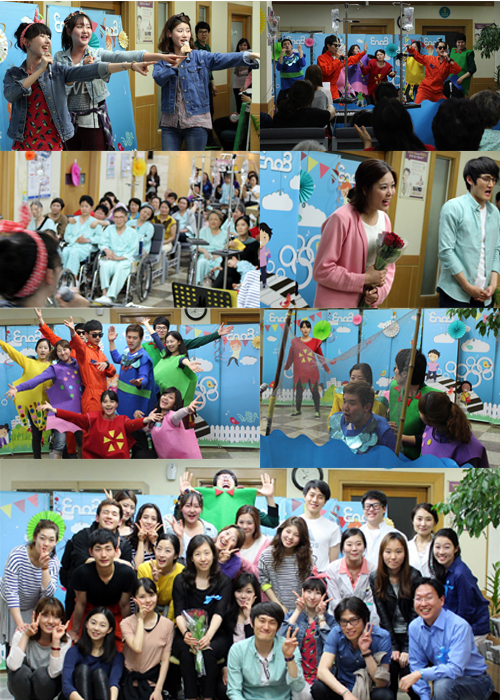 On May 27th, EnoB held a small concert for the patients at Seonam Hospital in Seoul. Three professional classical singers performed a concert there. 이노비의 뉴욕의 새로운 Music Director를 소개합니다. 나 경은님은 줄리어드 음대 석사를 졸업하시고 뉴욕과 한국을 오가며 활발한 활동을 하시는 피아니스트입니다. Lincoln center, Alice Tully Hall에서 데뷔하시고, 피아니스트로서 왕성한 연주 활동 뿐 아니라 오페라 코치, 콘서트 디렉터, 교육자 등 다방면에서 재능을 펼치고 계십니다. 앞으로 이노비의 새로운 뮤직디렉터로서 멋진 활약을 기대합니다. We would like to introduce EnoB New York’s new Music Director Kyung Eun Na. Ms. Na finished her Master’s at the Juilliard School and has been very active in the music scene in the United States and Korea as a pianist. She had her debut at Alice Tully Hall at Lincoln Center. In addition to performing as a professional pianist, Ms. Na holds other roles such as an opera coach, concert director, and teacher. We wish Ms. Na the best of luck as a musician as well as our music director! 2012년부터 지금까지 이노진 번역으로 이노비에서 활동해 온 이노비 주니어스탭 김병훈군의 콘서트가 7월 3일에 Northern Highlands Regional High school, Hopkins Hall에서 열립니다. 음악으로 행복을 전하는 이노비를 돕기 위해 친구들과 함께 기금마련 콘서트를 준비하였습니다. 이번 콘서트를 통해 마련되는 후원금은 장애아동, 투병중인 환자들을 찾아가는 이노비 아웃리치 콘서트의 기금으로 전달됩니다. 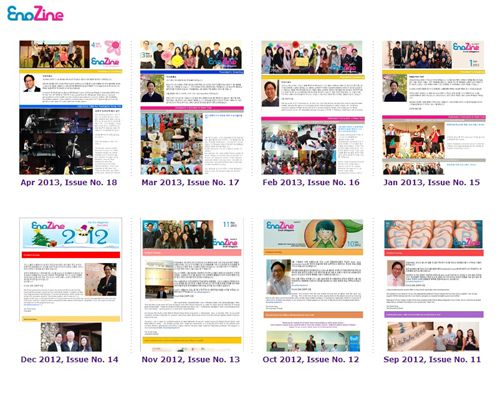 The first junior EnoB member, Byung-Hun Kim, started out as a translator and editor for EnoZine in 2012. Byung-Hun Kim was interested in supporting EnoB in their efforts and organized a concert with school friends to raise money for the organization. 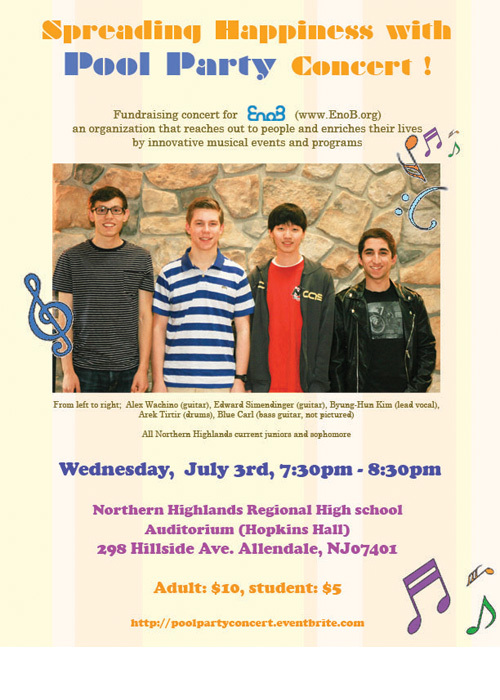 Pool Party members: Byung-Hun Kim (lead vocal), Alex Wachino (guitar), Edward Simendinger (guitar), Blue Carl (bass guitar), Arek Tirtir (drums) - all Northern Highlands juniors with sophomore Blue Carl. 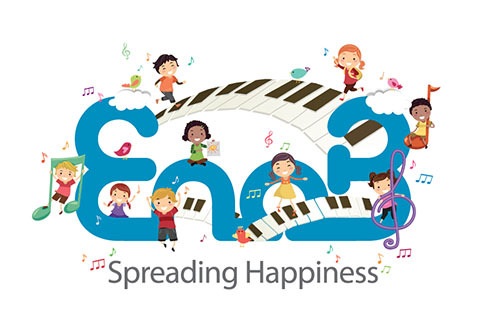 The first outreach concert with Easter Seals (located in the Bronx), will be an opportunity to create a relationship with the children through music. EnoB will host an outreach concert at the NYU hospital lounge for hospital patients on 17th street. The concert repertoire will include selections from Western opera and traditional Korean music. 이노비의 새로운 로고를 소개 해드립니다. The new logo was designed by Jae-Kyung Jeong.